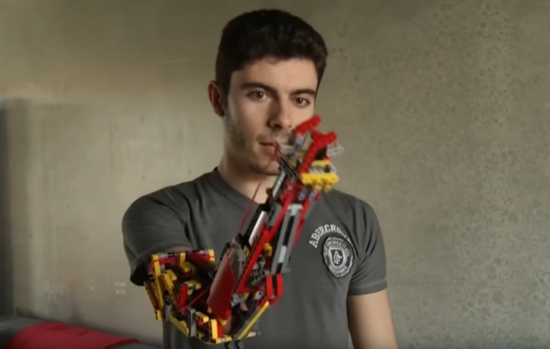 David Aguilar (19), who was born with no right forearm because of a rare genetic disorder, made himself a robotic arm of Lego bricks. Aguilar, who studies bio-engineering at the University in Spain, was already made few version of prosthetic forearms and his dream is to design affordable robotic limbs for those who need it. He made his first “hand” when he was just nine years old, and each new version had more mobility than the previous one. “As a child I was very nervous to be in front of other guys, because I was different, but that didn’t stop me believing in my dreams,” Agilar said. “I wanted to … see myself in the mirror like I see other guys, with two hands,” he added. All versions are displayed in his room at a university residence on the outskirts of Barcelona. The latest models are labeled as MK, as a tribute to the superhero Iron Man and its MK armor suits. Talking about plans after the university, he told that he want to create affordable prosthetic solutions to all people in need. “I would try to give them a prosthetic, even if it’s for free, to make them feel like a normal person, because what is normal, right?”, Aguilar added at the end of the interview.